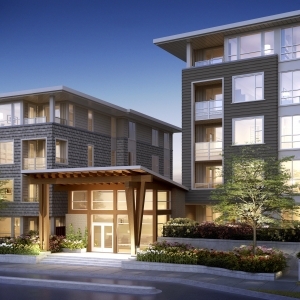 Set in the heart of Lynn Valley Village on the North Shore, you’ll find Canyon Springs – Polygon’s latest collection of apartment residences offering easy access to the best the North Shore has to offer. This limited collection of one, two and three bedroom apartment homes reflects an urban West Coast contemporary architecture. Inside, homes feature open living spaces and sophisticated interior design details including smooth stone counters, laminate wood flooring, custom cabinetry and sleek stainless steel appliances. Close at hand are an exciting array of urban amenities including the striking Lynn Valley library and shopping village, endless adventure opportunities on the local mountains, and convenient commuter access to downtown Vancouver and beyond. Designed by award-winning Ray Letkeman Architects Inc., Canyon Springs features contemporary West Coast architecture in a stunning North Vancouver setting. Admire the dramatic water feature, as well as the cast bronze art piece designed by local artist Marie Khouri. Premium rift-cut, flat-panel cabinetry in oak or glossy white is elegantly matched with polished chrome pulls. Rich laminate flooring sets the tone for tasteful design throughout. Interiors are complemented by sleek, stainless steel and black appliances by Whirlpool and Fisher & Paykel. Ensuites feature smooth engineered stone countertops, and polished chrome tub and shower faucets by Grohe. Enjoy the convenience of a residents’-only, fully-equipped fitness studio that overlooks a peaceful outdoor terrace. Please contact your local Realtor in West Vancouver, Oleg Tsaryov to set up the viewing and to see the floor plans. The first project in the brand new False Creek Central neighbourhood, One Pacific is ideally located just one block from the waterfront, Coopers’ Park, Yaletown, the marina, sports and entertainment district and everything else Vancouver has to offer. Every home is exquisitely finished withmarble, engineered quartz and hardwood, integrated stainless Miele appliances, wood veneer, air conditioning and over-height ceilings. The amenities are extensive and are also elegantly finished and include a pool with an overhanging glass feature, indoor and outdoor lounge areas, kitchen with tasting bar, roof top garden and barbecue area, 25,000 sq. ft. professional athletic club and fine dining restaurant. One Pacific was designed to offer residents a 5-star living experience. Please call your Realtor, Oleg Tsaryov in West Vancouver if you would like to set up the viewing.